prompt_toolkit was in the first place meant to be a replacement for readline. However, when it became more mature, we realised that all the components for full screen applications are there and prompt_toolkit is very capable of handling many use situations. 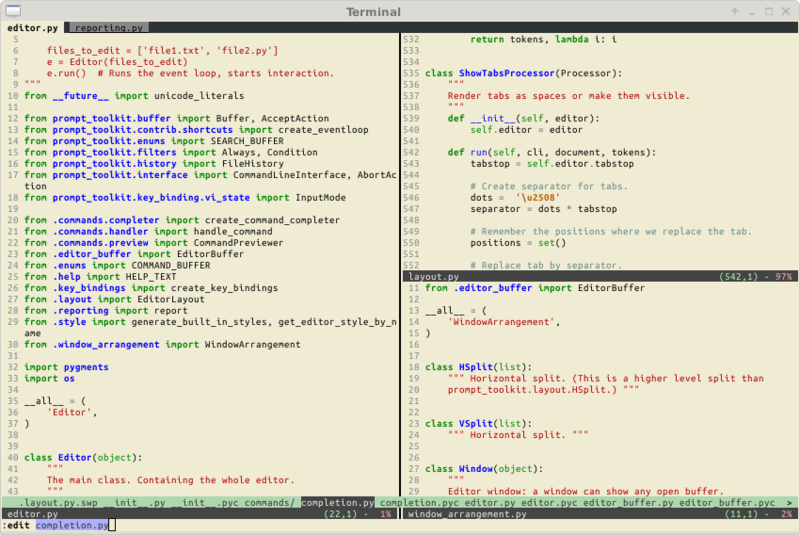 Pyvim and pymux are examples of full screen applications. Basically, at the core, prompt_toolkit has a layout engine, that supports horizontal and vertical splits as well as floats, where each “window” can display a user control. The API for user controls is simple yet powerful. When prompt_toolkit is used as a readline replacement, (to simply read some input from the user), it uses a rather simple built-in layout. One that displays the default input buffer and the prompt, a float for the autocompletions and a toolbar for input validation which is hidden by default. For full screen applications, usually we build a custom layout ourselves. Further, there is a very flexible key binding system that can be programmed for all the needs of full screen applications. The following snippet is the most simple example, it uses the prompt() function to asks the user for input and returns the text. Just like (raw_)input. In order to learn and understand prompt_toolkit , it is best to go through the all sections in the order below. Also don’t forget to have a look at all the examples examples in the repository. First, learn how to print text. This is important, because it covers how to use “formatted text”, which is something you’ll use whenever you want to use colors anywhere. Secondly, go through the asking for input section. This is useful for almost any use case, even for full screen applications. It covers autocompletions, syntax highlighting, key bindings, and so on. Then, learn about Dialogs, which is easy and fun. Finally, learn about full screen applications and read through the advanced topics.